Bring mythic adventure into the Pathfinder world with Pathfinder Campaign Setting: Mythic Realms. 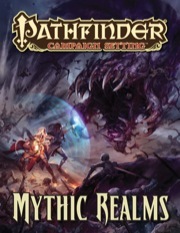 This must-have expansion to the Pathfinder Roleplaying Game’s newest and most ambitious hardcover, Pathfinder Roleplaying Game: Mythic Adventures, is your guide to epic legends, secret places of power, and mythic hot spots within the Pathfinder campaign setting that unlock phenomenal new power. Learn how to seamlessly integrate the incredible options from Mythic Adventures into your existing game, unlock additional path abilities for mythic characters to choose from, discover locations primed to inspire new mythic heroes, and claim the strength of monsters and villains too powerful to defeat—until now! Forge new legends and take on the greatest challenges of the Pathfinder world with Pathfinder Campaign Setting: Mythic Realms. Six founts of mythic power, including the Doorway to the Red Star, the Mordant Spire, and even the legendary Starstone, each with new mythic path abilities available to characters who show their worth and claim the power within. Six detailed locations throughout Golarion that offer a campaign’s worth of adventures for characters of mythic destiny, including the vast necropolis of Mechitar, the Pit of Gormuz, and the flying city of Yjae. Nine legendary characters of Golarion, including challenging foes only those of mythic might can hope to defeat, like Arazni, Kortash Khain, the Oliphaunt of Jandelay, and the Whispering Tyrant. Mythic trials tied to each location and character, ready to drop directly into a mythic campaign. Pathfinder Campaign Setting: Mythic Realms is intended for use with the Pathfinder Roleplaying Game and Pathfinder campaign setting, but can easily be used in any fantasy game setting. Written by Benjamin Bruck, Jason Bulmahn, Amanda Harmon, Nicolas Logue, Jason Nelson, F. Wesley Schneider, and Russ Taylor. Cover Art by Michael Ivan. Perfect high level fluff and crunch! The most powerful and mysterious locations of Golarion are described! My favorite: THE BLACK DESERT - one of the 6 vaults of Orv, home to a house of Urgathoa-worshipping undead drow, the birth-craddle of the Purpleworms, tribes of Urdhefan and a cabal of awakened demiliches! The most powerful and legendary beings of Golarion are statted out! If you want your players to fight the "Whispering Tyrant", he is in here! The writeup for the Black Desert inspired me so much, that i began writing an outline for a novel featuring the undead drow as protagonists in the style of the "war of the Spider-Queen" series. The same is certainly possible for each of the locations in here! Mythic Realms introduces the mythic rules to Golarion and takes a look at how they interact with the setting. It provides information on founts of mythic power, locations, and mythic characters. Just as there is a lot of variety to mythic characters, there’s a lot of variety in the book, particularly in Chapter 2: “Places of Myth”. Indeed, each location detailed is often different enough from the others to make it feel almost like you’re reading a different book. This does have the downside that most people are only likely to use one or two small sections of the book, and few people will actually find use for the entire thing. Still, it’s a good book and definitely useful for people wanting to introduce mythic rules into their Golarion campaigns. It’s also an entertaining read for people already familiar with Golarion, as it adds detail to a number of things that have only been mentioned or hinted at before. Mythic Realms is the latest addition to the Pathfinder Campaign Setting, and promises some impressive ideas. Powerful figures from Golarion's lore, sites of incredible power, and even the legendary Starstone. But closer examination finds the book's contents lacking, its concepts deprived of the execution expected of a Paizo work. Chapter I contains information on Founts of Mythic Power, like the Cenotaph, the Morudant Spire, and even the Starstone(!). Mythic Founts are sort of like "seeds" GMs can use to transform high-level groups from extraordinary to truly heroic. The idea is great--it provides GMs with high-level groups to continue the adventure even when all other challenges begin to feel trivial. Furthermore, there are unique mythic abilities tied to the mythic ascension that occurs at each location. The problem here is that not all founts are created equal, and this is particularly true of the Starstone. First off, the mystique of the Starstone test is all but obliterated by the book's presentation, and second, the Starstone's role in the lore is inexplicably changed. Suddenly the Starstone is only a means of mythic ascension, not the engine of divine apotheosis we've been lead to believe. What's worse is that the mythic ascension triggered by the Starstone provides bonuses linked to pre-existing gods, and only the twenty greater powers of the Inner Sea (so no blessing of Apsu, Tiamat, Shizuru, Tsukiyo, &c). Furthermore, Mythic Realms paints a very confusing picture of Golarion's history. Did the Aboleth fear Azlant, or did they grow bored with their human experiment? The historical accounts in the Morudant Spire seem to conflict with those in the Starstone, but this isn't the only contradiction. The history of the war between Azlanist and Karzoug grows more confusing. Who was winning? Who was planning to summon the Oliphaunt of Janderlay? Chapter II is, in my opinion, the best part of this book. It contains Gazetteers on six locations for your mythic heroes to explore. Although, again, historical accounts sometimes contradict themselves (I now have two conflicting accounts of what happened to the city of Gormuz). Still, the imaginative settings give GMs a lot to work with when planning their own adventures, and one entry can provide dozens of potential ideas for any given mythic campaign. If Chapter I is my least favorite and Chapter II my most, then Chapter III falls somewhere in the middle. Here we find a bestiary of several legendary figures throughout Golarion's lore, from the terrifying to the heroic. This is both a good and a bad thing, in my opinion, as it provides mythic groups with epic challenges, but at the same time somewhat demystifies these otherwise mythical characters. There is an adage once uttered on "The Spoony Experiment," which goes "if you can stat it, they can kill it." Simply put, this suggests that if you give a creature concrete representation in the rules system, then it becomes subject to the whims of that system, including death. Now, there are always ways to get around this (AD&D Fiend Folio's Trillioch, anyone?) but caveats that prevent defeat kind of feel cheap when you have a fat block of numbers and words staring you in the face. That said, the histories of each mythic character are fantastic, if not unfortunately brief in some places. They manage to retain the intangible nature of the myths and representations these characters enjoyed in previous source material, never willing to commit too much detail where detail isn't needed, which in my mind is only ever a good thing. All-in-all, the book had some great ideas and inspires some great ideas. The problem comes with the mechanical execution of those ideas, and the inconsistencies generated by its new treatments of setting-specific features. It's a 2-out-of-5, worth having for the ideas, but not the rules. Will there people Mythic NPC/Monster Stats of Golarion Iconic Enemies that have not been stated prior due to their power level? Row closer! Valeros wants to hit it with his sword! This looks terrific. Where is the cover from, by the way? I am not sure about this one since I am still on the fence about the hole mythic thing anyway. I was hoping mythic realms were about mythic realms that you know had nothing to do with mythic rules. Like a book that talked about the first world, plane of time, plane of dreams, etc. Merisiel: "This is not what I had in mind when I said I felt like having calamari for dinner!" Yessss. I think this will be very useful for my Mythic post-serpent's skull game. I kinda agree I would like to see places like the First World and stuff like that explored at some point. Which I am pretty sure it will be. (I am going on a limb here but my guess is that Fey Revisited will have First World stuff in it). But I can be patient. Hmm. My guess is that Paizo probably wants to make sure 'mythic' exists on Golarion itself before expanding things into the planes. But yea, I'd also be interested in seeing things expanding into the First World and such. Mythic, overall, is something I'm VERY interested in. 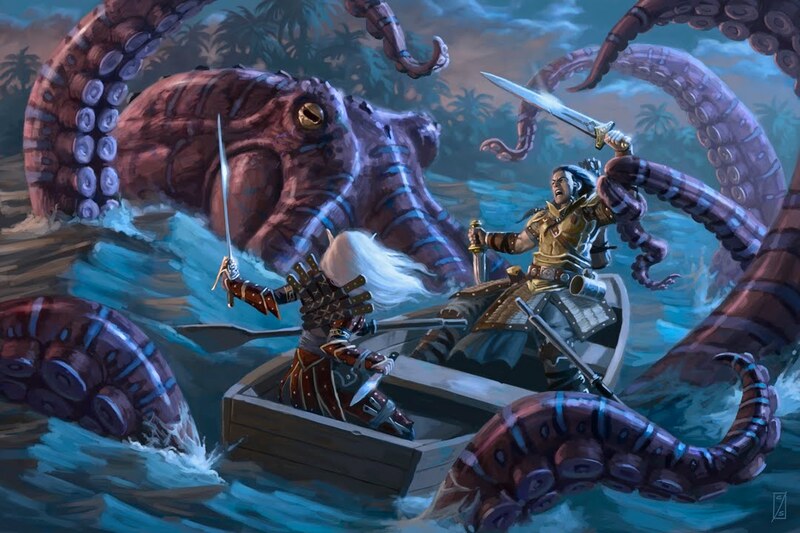 Steve, I'm not 100% sure ... but I think it's artwork from "From Shore to Sea" the Pathfinder Module by Brandon Hodge. This is coming out in September. My birthday is in September. Dean, it's similar to "From Shore to Sea", but that one is greener. Tentacle monsters are sort of their own art genre around here, though, and I can't place this cover either. Anyway, I am VERY excited for this book! This looks to be a very cool cook! It'll be interesting to see what things alluded to in the Inner Sea Guide are called out as mythic. So... explore the Isle of Terror, slay Tar Baphon, and claim the Starstone? Sold! 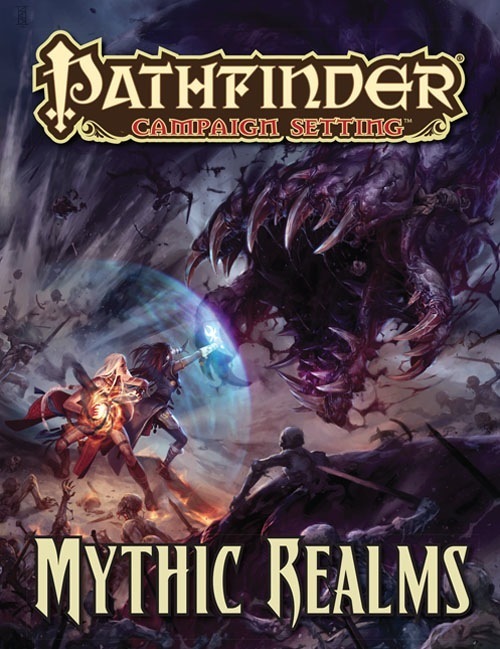 The must-have expansion to the Pathfinder Roleplaying Game’s newest and most ambitious hardcover, Mythic Adventures, this guide to epic legends, secret places of power, and mythic hotspots infuses the Pathfinder campaign setting with phenomenal new power. ...which indicates, to me at least, that Mythic Realms will be a companion to the hardcover Mythic Adventures, not that Mythic Realms will be a hardcover. As a Campaign Setting book it will be 64 pages. How will this book be set out? Will it focus on say 6 specific locations like Dungeons of Golarion or Lost Cities of Golarion, or is it broader in scope? It's not organized really like any other book we've done. You'll recognize some stuff, but the exact elements don't follow the overall format of another book. Are the Mythic Rules the necessary element to write up more of Casmaron/Kelesh Empire? Or is that also hinging on Psionics like Vudra is? If there is nothing on the Starstone I will be sorely disappointed. But one can't judge a book with what it doesn't have without first knowing what it covers. We can't do Casmaron without Vudra, and thus can't do Casmaron without psionics. Have you considered, or at least taken a look at, Dreamscarred Press's books? They've taken 3.5 psionics and put them through the wringer until they're actually good and reasonably balanced, and with a lot more variety than the original. You could do a lot worse than integrate their stuff. I've looked at Dreamscarred's books, yeah. They're the logical starting place for what we want to do with psychic magic, but they won't work as-is, since we're not going to do a point-based system for this type of magic. Which is why we're calling it psychic magic and not psionics–it's based on the same concept (magic/supernatural powers from the mind) but it's not the same rules. The actual rules will likely work just like magic... but will be a new category that exists alongside the categories of "arcane" and "divine" magic. I have never liked psionics, but the above idea I like. The challenge clearly is, why have we not seen any mind mages in the Inner Sea until now. I imagine its a similar retcon to the gunslinger. This is exciting. I have yet to allow psionics in any game I've run because I have yet to find a ruleset I like. Dreamscarred's book is pretty good, but still not quite what I'm looking for. I also like that idea for psychic magic, never liked the point system for psionics. Well, damn. Makes sense though, especially if there's enough contact between them (currently, and historically re: Ninshabur) that you want to do up the whole area like the Inner Sea Region was done up. Having that ONE satrapy of Kelesh (Qadira) detailed and on the map, but not the rest is a brutal tease, but I'm sure it'll be great when you get around to it. New rules for psionics/etc aren't really my main interest, but I can see why it would be more problematic to write up the region first and then try to ret-con in that material. We're not going to do a point-based system for this type of magic. Which is why we're calling it psychic magic and not psionics–it's based on the same concept (magic/supernatural powers from the mind) but it's not the same rules. The actual rules will likely work just like magic... but will be a new category that exists alongside the categories of "arcane" and "divine" magic. Sounds great. I never liked the idea of creating new classes whose features mostly do exactly the same things, but for some reason they aren't considered to be casting Fireball/Dominate Person/etc. I think this approach is alot more amenable to including these classes/monsters in normal Campaign Setting material even for people who don't generally use the Psionic Rules material. Calling it 'psychic magic' (not using the phrase 'psionic') is a good approach given some of the expectations some people have re: 'psionics', it's putting it out front exactly what you're doing with this. Do you expect to implement it via new classes, archetypes/alt-versions of existing classes, or both? It's not a retcon at all. There are some monsters in the Inner Sea region who use what is essentially psychic magic in the form of spell-like abilities, like intellect devourers, seugathi, and neothelids. Psychic magic using character classes will remain rare in the Inner Sea region even after we detail the rules—they'll primarially be classes who operate in Casmaron (mostly in Vudra), simliar to how samurai and ninja are rare in the Inner Sea region but much more common in Tian Xai, while clerics and paladins are common in the Inner Sea region but pretty rare in Tian Xia. Man, this is awesome. So many questions! Is it hardback? What's the page count? Will it deal with planes as well? I'm all about some Mythic, so this is right up my alley. Day 1, baby. It's a 64 page softcover. It's not really focused much at all on the planes. Cool beans. Thanks for the answers. That is indeed a very good explaination oh mighty dinosaur. Those creatures did not occur to me straight away. Sign me up for another book! Given that Baba Yaga's stats will appear in the final Reign of Winter installment, is there any chance that Mythic Realms will provide the stats of other major NPCs such as Geb, Nex, Arazni, Artokus Kirran, Jatembe, Kortash Khain etc? Would folks LIKE to see stats for some of the above NPCs? No. They're completely useless apart from the "oooh ahhh he/she is thaaat powerful ohmigosh ohmigosh that's gonna be so cool if I could get them to fight Batman and Chuck Norris and maybe also Optimus Prime" reactions which I left behind a good dozen years ago. I wouldent mind them more NPC stats are always usefull.